Sorry for the lack of posts lately.... I have been trying to reclaim my mind. Lately I have had trouble with focus and just plain old fatigue of the body and brain. So during my working vacation I have been trying to get back into the groove. Of course this medical thing seems to flair up from time to time more frequently, and that sure doesn't help. But as you can see the working vacation wasn't a totally unproductive one. 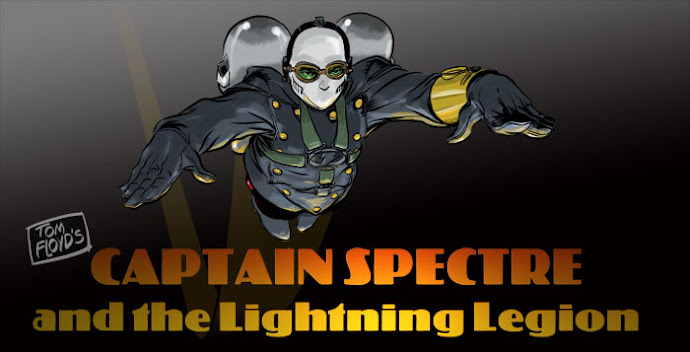 Among the many things I have tried to accomplish, is working on the script to the first issue of Captain Spectre. To help my mind get into the character again and try and come up with a good story I worked on one of the cover concepts I have kicking around for the first issue. The title is just a place holder for now. I don't want to give anything away just yet. 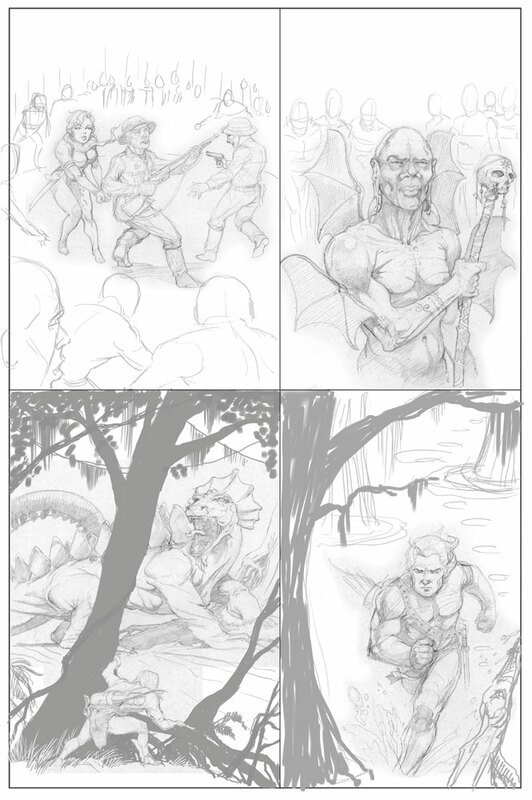 Also working on KiGor was a priority, so another page of layouts, and a large battle page to tempt everyone into buying the story when we get it done. I also have to content with going back to the day job. Which I have been really hating lately. But I do have to wrap my mind around going back with the focus of getting some work done there. I have a couple of large projects on the desk and they do need my attention. I just have to get back into keeping the day job and the night job separate. It has always been tough for me to do. But I really have to do it this time. And not get emotionally involved in the day job. Just do the work, and don't worry about it. I know that sounds kind of like I am giving up, and in a sense I am. First you must understand the job. Everything is done by committee now. I, as a designer, don't really design anything. Oh, maybe the first time around I do, but with all the changes and opinions that get thrown at a project...they never end up looking like I think they ought too. So anymore I just push the pixels around til someone in charge likes it. This used to really bother me. For years, I tried fighting for what I thought and believed in. Well no more. I am tired of giving up good ideas, and they never get used. Good designs that get totally changed. With a planned early retirement four or five years away, I just can't see worrying about it all anymore. I know with that statement my parents are probably spinning in their graves. But, the fight is all gone. I will gladly do what I am told, no matter how stupid I think it is. They are the bosses, and I just the pixel monkey. So I hope letting go of all that helps me produce more work at night and on the weekends. All I can do is forge ahead. Well, I felt I needed to post a few things that are in the production pipeline. The Helene sketch is just a hair-do concept. I realized as I started drawing her, I didn't have a good handle on how her hair was to look. You know the basic forms of the hair, as I draw it I block in the major building blocks, and as I started the strip her hair was all over the place. Ha. So I had to figure it out. Seems kind of odd to do something like that, but I am trying to really nail this strip and wanted her to have the same hair from panel to panel. 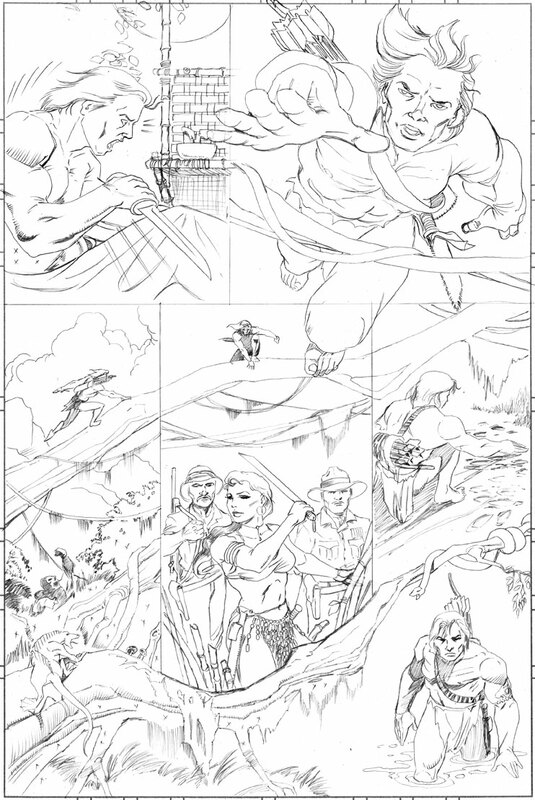 The other piece is revision of one of the panels on an upcoming page. 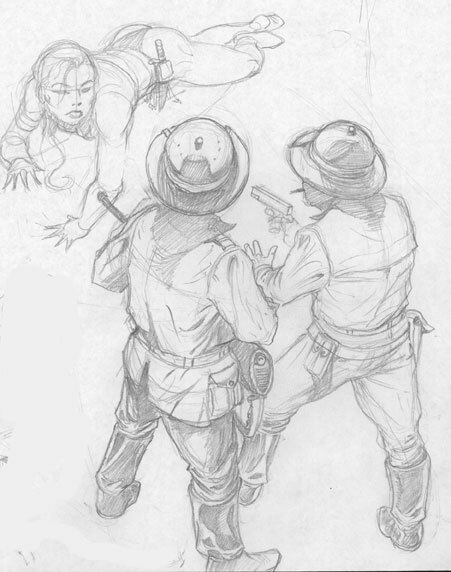 Just trying different layouts and storytelling forms, and can always use the practice drawing odd angles like the slightly down angle of two guys. 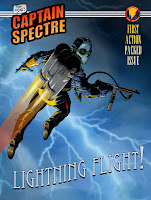 Then a Captain Spectre cover concept done a while back, but just got around to scanning it the other day. 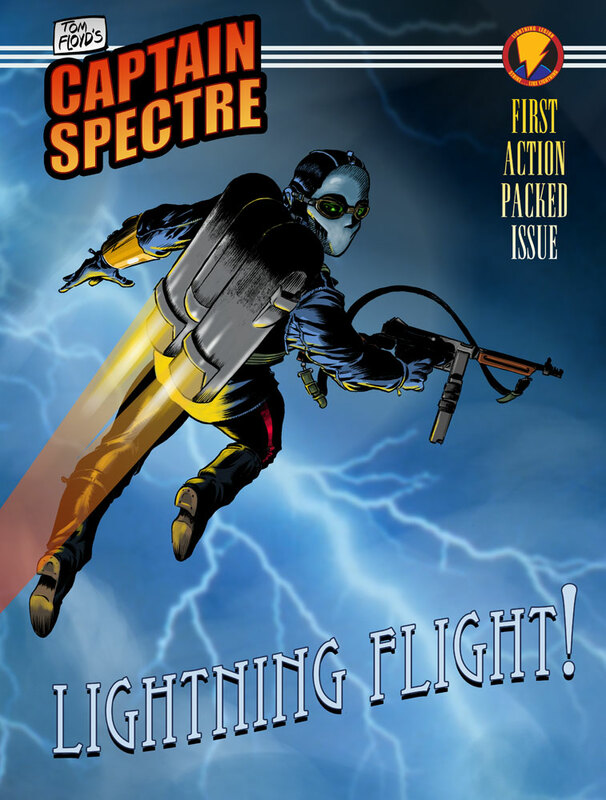 See I am working toward the day when a Captain Spectre comic is a real thing. Also I had mentioned the doctor visits lately, well one of my slight fears has come true. Seems I having these pains in my hand and arm when I drew too long or worked too hard. Well seems I have rheumatoid arthritis. I am working with the doctor to take some of the pain away so I can sleep and draw more. I am taking a few things, that they are trying on me. So we shall see. The steroids he is giving me in burst form seem to be helping knock the pains down a bit. So when I mention the hand being tired or sore you Loyal Legionnaires and Jungle pals will know what I am talking about. So forgive me if sometimes my production slows down a bit. thanks. Joining the Influence Map club....everyone seems to be doing it. Well it seems everyone around is doing these things. I started on this one the other day, actually a week or so ago, but finished it the other night ....and on a lunch time break, I thought I would go ahead and post it. I could of filled up many more of these things. But I tried to stick to the raw beginnings of all my influences. I could have put more illustrators in there like Greg Manchess and all, but knowledge of those guys came later. I focused on the stuff of kids and my youth a bit. Also many of these have double or triple meanings. Like the Sgt. Fury #13 is for Captain America, Jack Kirby, and all the great Marvel comics of the silver age, it also represents the odd DC stories I loved like Challengers of the Unknown and just comics in general. The same way with Milton Caniff. I admired the man, and his works. So look, or think about double meanings for alot of these images. 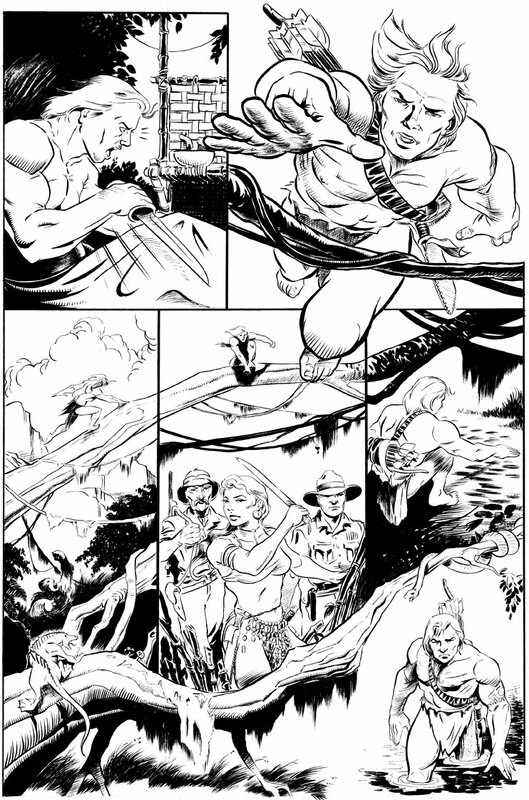 Well, with a day and a half of hard work, here is the page I posted yesterday morning - inked and ready to roll. I hope it still works in this stage. I took extra pains to ink this. I might add that except for the straight lines breaking the panels....It is all brush! No quill was used. As I posted at the end of the last comments I do appreciate your posting and feedback. I sure hope I am not spoiling the excitement of the story by posting pages. After all it is what I do, is draw....so I just hope it isn't spoiling a purchase. The KiGor back up story will need all the help it can get to keep going. As before Jungle stories are a hard sell to people. I love them, but most people other than pulp fans, don't even care for them. 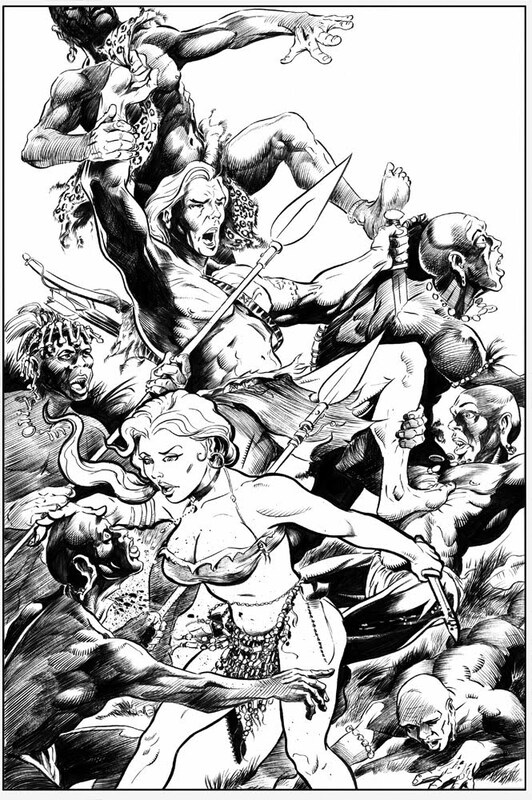 But they are really fun to draw with all the animals and the organic nature of the jungle and backgrounds. Anyway I just wanted to post this, it has been a long day for sure. I had a doctor's appointment this afternoon, so took a sick day to fix myself mentally by inking the page. But more on the doctor thing later. Hello Loyal Legionnaires and Jungle pals....well it is Labor Day, and I am laboring. 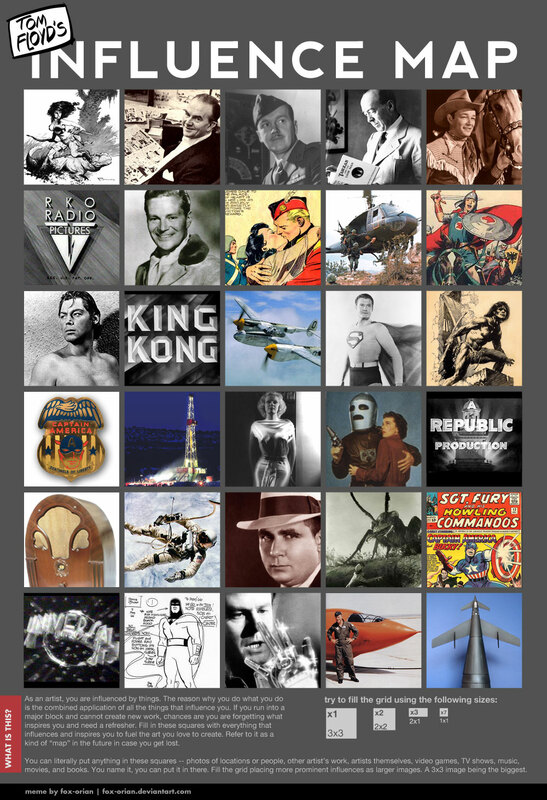 I am working on one of the strangest layouts I have ever tried to do. I hope it shows a bit, but I have put in alot of time on this one. It is so complex in the layout that I had to do it several times and even redraw some of the panels and lightbox them so I could get it all in. Ha, and I just realized as I posted it that KiGor is in every panel. Anyway I will tell you this might be a bit of a spoiler, but mainly I wanted to post it to talk about the art. I needed to show the passage of time, that it takes KiGor to track Helene, and I also wanted to show that his sense are so perfected that he can almost see the people he tracks - like a vision or something. Along with the passage of time, is the distance traveled and how KiGor travels in the jungle. 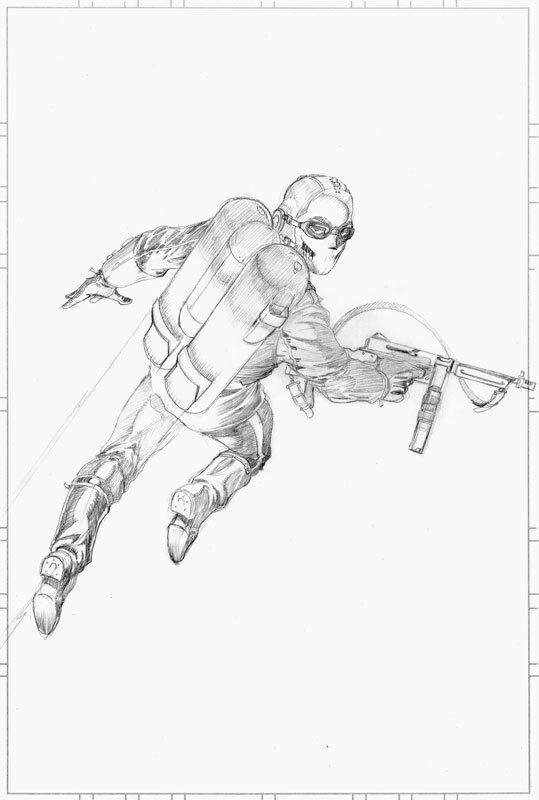 The reason the pencils look alot cleaner than my normal pencils is because I had to lightbox so much of it. Also the figures are rather small in each panel and the paper I use doesn't take much punishment, so if I want to use a quill to do the details I have to be careful using my eraser. I tend to pencil pretty heavy so I tend to cut into the paper a bit much, which makes my quill line bleed into the fibers. 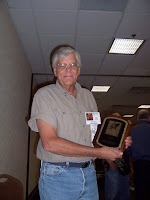 Also I talked Martin Powell, the writer of the story to work like the old Marvel way. So the layouts and choices are all mine. If it doesn't work in the final story, blame me. Don't blame Martin since I talked him into it. Martin is the best writer I know and his story really rockets along, so I was on task to get this page with as much visual info as I could get into it. I hope it works, now the rest of the day is touching up the pencils, spotting my blacks, and doing some really fine line inking as I can do. I hope it works out in the end. Because I have to put my best foot forward here, KiGor is a unknown character to most of the comic public. Pulp fans know of his exploits and that will bring in a few people. Jungle stories are a hard sell, I love them but most people just let them go by. But I think if I can do a good enough job on the art, and people read Martin's story, I think we can make people look at jungle stories with the adventure of a little kid again. I hope. 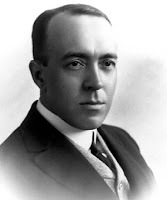 Edgar Rice Burroughs was born in Chicago on Sept. 1, 1875....he died March 19, 1950. I only meet the man through his many novels and stories. He died before I was born but he lives on by giving us his mighty heroes and wonderful worlds. Happy Birthday Mr. Burroughs and I owe you alot. I owe part of my imagination to you, I owe you for helping me when my father died as I usedyour heroes for a guide to the ways of right and wrong. And now I owe you for one of the greatest nights of my life.